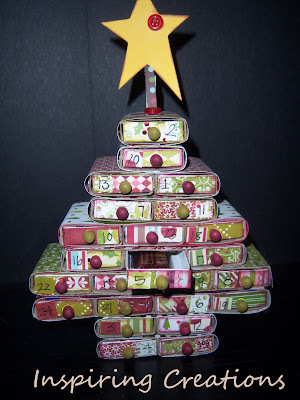 For Craft Night this month we are making a Christmas Tree advent calendar. I know it's a little early to think about Christmas and Christmas decor....but it's going to be here before we know it! So why not be ready for it?! Anyways, I have seen a couple of these made out of the big matchboxes, but to make it fit within our ten dollar budget I made one out of the mini matchboxes! I love how it turned out and it fits a mini Hershey's candy bar perfect!!! I will post a tutorial later this month after we make these for craft night! Let me know what you think. I cant wait to see the instructions! I have to tell you, you are on the top of one of my new favorite blogs! 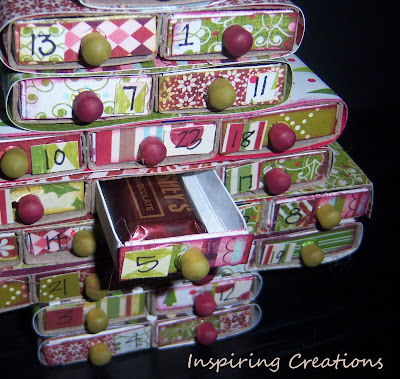 I love too the craft night idea! The other night a friend came over for tea and we ended up playing around with my cricut ~ we decided to have a craft night, I told a few other friends and everyone is asking WHEN? 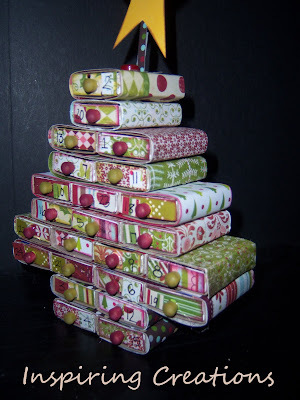 Then I find your blog and you actually do have a real craft night and now I am inspired to make it happen!